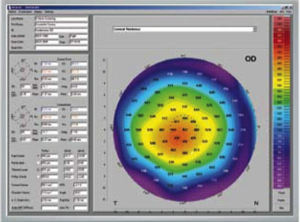 Using Eyecode, our opticians at The Spectrum Eye Centre are able to determine the position of each eye's rotation centre individually with a single measurement, which is obtained quickly and conveniently. Combining this eye data with frame and head/eye behaviour data makes it possible to create a vision profile as unique as your fingerprint. With eyecode lenses, you get the most precise vision possible, no matter where you look through the lens . The VisiOffice 2 -runs in three dimensions and establishes thecenter of rotation for each eye. This allows the perfectly tailored Eyecode prepared lenses with the ability to optimize the visual performance. Just like our fingerprints and many other features of our individuality, each and every person's eyes are different and completely unique, making the one-size-fits-all approach of lens measurement an obsolete relic of the past. 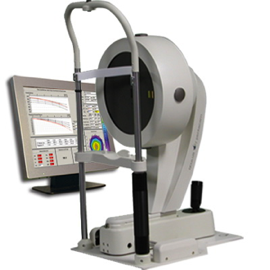 Visioffice 2 is the latest innovation in lens measurement technology. This amazing technology allows us to capture high resolution 3-D images of your eyes, providing a more accurate, personalized eyeglass lens, customized to your entirely unique visual condition. Visioffice 2 also features an exclusive and revolutionary new measurement, called Eyecode, which allows us as your optometrist to go the extra mile in personalizing your lens prescription by measuring your Eye Rotation Center (ERC). Visioffice 2 high-precision measurements detects all physiological parameters, postural and behavioral parameters to offer you the best visual comfort and outcome. With dynamic fluorescein image simulation, the fit of the contact lens from the intergrated database can be viewed. 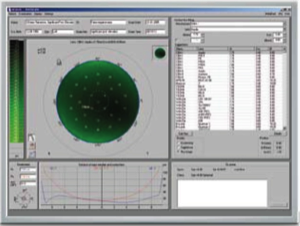 The simulation makes it possible to adjust inclination and to shift the contact lens while automatically making a new fluorescein image calculation. The integrated and expandable data bank contains over 65,000 lens geometries. The contact lens geometries can be adjusted individually in cases where fitting is difficult. The user can establish his own rating list for contact lens manufacturers and can expand the database with new or further contact lenses.